Japan Brown bear Brown bears rank with polar bears and Siberian tigers as the world's largest land carnivores. The largest known brown bears weigh around 850 kilograms (1,800 pounds) and stand also four meters (12 feet) tall on their hind legs. Brown bears have been around millions of years, sharing Siberia, Eurasia and North America with mammoths, mastodons, giant beavers and saber tooth tigers. Polar bears evolved from brown bears. The two species are similar enough that today they have breed in zoos and produced fertile offspring. There are around 70,000 brown bears and grizzly bears in North America. There are also large numbers of them in Russia and they are found elsewhere in northern Asia and Europe. For some reason there are lot of them in Romania. The rare Tibetan bear is among the brown bear subspecies. See Separate Article BEARS AND HUMANS and BEAR ATTACKS. Brown bears found in Spain, Italy, Scandinavia, the Himalayas, Russia, some of the former Soviet Republics, Romania, Japan's Hokkaido island, Mongolia, India, Canada and the United States. All brown bear are members of the species Ursus arctos. Among the dozen or so brown bear subspecies are the grizzly ( Ursus horribilis), the Kodiak and Kamchatka brown bears. The Kodiak bears are considered the largest bears. They often weigh over 700 kilograms (1,500 pounds) and can stand three meters (nine feet) tall. They main reason they are bigger than other bears is they that have abundant supplies of protein and food: namely in the form of salmon and carcasses of animals that wash up on the cold water beaches where they live. Brown bears living along the coast in Alaska and British Columbia are the largest brown bears. Those found inland in North America are known as grizzlies. Grizzlies have a more pronounced muzzle and a more dish-shaped face than other brown bears. They get their name from the 'grizzly" silver-tipped fur on the upper parts of their body. Brown bears grow considerable larger than grizzlies (male Browns weigh up to 1,200 pounds compared to 600 pounds for grizzlies) partly because they consume more protein in the form of fish. Grizzly bears have an average life span of around 25 years. A grizzly bear in captivity has lived to the age of 40. The average longevity of black bears is 12 years. A black bear has lived to the age of 38. Studies of grizzlies at Yellowstone National park indicate that male cubs outnumber female cubs two to one. At the age of three and four males and females are equally numerous. Among adults female predominate. Brown bears are usually dark brown but they also can be gray, tan and black. Brown bears can be distinguished from brown-colored black bears by their larger size, dished-in facial profile, maned hump on the shoulders and long front claws. Some say the breath of brown bear is more like wind. Brown bears can stand almost four meters (12 feet) tall on their hind legs and outrun a horse at short distances. They usually moves along at an ambling pace or fast walk with their head down. When alerted they lift their heads up and move at a trots, or at top speed in full gallop. Brown bears are able to swim across large, fast moving rivers. They have also been observed ascending and descending precipitous canyon walls. Their huge size prevents brown bears from climbing trees as black bears do. Bears have keen senses of smell and hearing. Contrary to the popular myth, brown bears have very good eyesight. They are especially adept at detecting movements at long distances. They are very short sighted. Brown bears have long claws that can inflict severe wounds. They use them to dig up roots and tubers. Brown bears like to play. Even adults have been observed sliding down snowy hills, toying with fish by tossing them around, play wrestling in water holes, scratching their backs on trees, and playing tag with ravens. They have also been observed shadowboxing with their own breath and making snowballs. Doug Seus, a Hollywood animal trainer told National Geographic, "I train black bears, wolves and cougars for film work...My grizzlies and Kodiaks are the hardest to tame, but the easiest to train; generally you only have to teach them something once. They can also be the most affectionate." Some brown bears can pick up a heavy object and spin it on their claws like spinning basketball on a finger. Alerted bears sometimes stand on their hind legs, salivate a lot and make a woofing noise. Most charges are bluffs. If a bear charges with its ears erect that generally means it’s a bluff. If the ears are folded back and you can hear their teeth popping then the charge is for real. Brown bears are largely solitary animals that wander large distances—up to 80 kilometers (50 miles)—each day. Males cover perhaps twice to three times as much ground as sows. Males are often solitary while sows often hang out with their cubs. 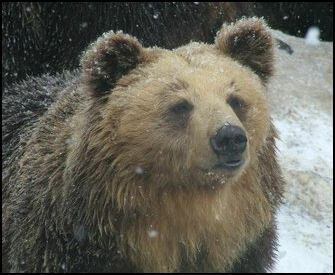 Because they cover large distances in the search of food, brown bears are less territorial than other large carnivores. Home ranges of different bears often overlap. When bears come in contact with one another they usually keep their distance and don’t fight with one another. Size and aggressiveness often determines pecking order and bear behavior. At the top of the hierarchy are large males. After them are females, willing to fight aggressively for their cubs. Further down the ladder are young males. Dominant bears often get the best territory and the choicest feeding areas. When a group of bears gather together, usually in prime fish areas, sometimes they compete for dominance but generally tolerate each other. Bears that travel together usually walk in single file in the same order. “Local authorities in Slovakia, Bulgaria, Hungary, Austria and Bulgaria have also issued safety warnings. Forest rangers and conservation experts have warned people to stay away from the animals, as they are likely to be in a "confused state", reports the Daily Express. Bears have been pestering hotel guests in Brezno, Slovakia. Miloslava Kicova said: "They come round to the hotel late at night, fighting with each other and looking for food." Brown bears are mainly vegetarians, feeding on blue berries, roots, soapberries, glacier lily bulbs, cow parsnip, huckleberries, pine nuts, tubers, grasses, sedges (protein-rich plants), and leaves. Grizzlies are fond of berries and white-bark pines nuts. On brown bears, the naturalist John Muir wrote, "To him almost everything is food except granite." Brown bears thrive in alpine meadows and pine, cedar and fir forests. Those that live in tundra regions are less well fed and live more of a feast or famine existence. Brown bears eat things like grasses, roots and parsnips in the spring, fish in the summer and berries in the late summer and fall. Bear traps are typically baited with a mixture of bacon, honey and pineapple juice. Brown bears are also skill hunters and opportunistic feeders that feed on salmon, char, trout and other fish, birds, mice, gophers, elk, and rodents and even insects. They have been observed feasting on masses of moths. They also scavenge dead animals. Bears in coastal areas often feed on walrus, seal and whale carcasses that wash ashore. Brown bears occasionally catch moose or caribou caves, but very rarely, and sometimes dig up rodents. They have been observed digging up squirrel and fox dens but usually with little success. They have more success with ants taken from giant ant hills and ground squirrels that are still hibernating under the snow when the bears emerge from their dens. One scientist observed a bear bring down a caribou that had been severely wounded by wolves. Some brown bears bury their uneaten carcasses. Their keen sense of smell enables them to locate carcasses a long distance away. Adult males sometimes attack and eat cubs. Males have been observed attacking young females and eating part of them. Brown bears are famous for feasting on salmon during the annual runs up rivers and streams. A 450 pound bear may consume 45 pounds of salmon a day. When the fish are scarce, bears often fight over prime spots. When fish are abundant, fighting is rare. The bears feed on salmon in the late summer and fall when the salmon enter coastal streams from the sea to spawn. The timing of this if perfect for the bears. They need to gain as much fat as possible before they hibernate. Females need extra fat if they are pregnant so they can get through the birth and produce milk for their cubs. Bears use a number of techniques to catch fish. Some bears chase the fish onto the shore. Others stand at the tops of small waterfalls and catch the salmon as they leap upwards. The best technique seems to be pinning the fish to a rock on the bottom of a river with the forepaws and grabbing it with the mouth then crushing the fish in the bear’s jaws. Mother do not teach they cubs how to fish. Instead they let them flounder around in the water and develop their own methods of catching fish. Some brown bears swat and garb the fish. A few have been observed belly flopping in a river off of a rock. One caught two salmon in 15 minutes by pinning the fish to the bottom of the river bed with its large paws. Salmon are more pallid at night and easier to catch. Some bears have a special taste for salmon brains. Other eat the entire fish save the testicles. Bears tend to eat the fattiest parts of the fish and are particularly fond of the eggs, which are mostly oil or fat. Bears that have access to salmon streams tend to be larger and have more offspring than other bears. The bears also give something back. The carcases they leave behind are fed on by eagles, martens, ravens, gulls, beetles and fly larvae, even deer and squirrels. In places where bears feed on salmon there are sometimes very large trees. These are the result of the fertilizing affect of the nitrogen-rich salmon carcasses left behind and the nitrogen-rich feces and urine left by the bears. Brown bears have slow reproductive rates. During the third or forth spring after birth, many females are ready to breed. The breeding season is from late May to mid July but the egg does not implant into the womb until the fall. Only about a third of the available females breed. The others are mostly taking care of cubs. Males and females are promiscuous. During the breeding season males are ill tempered and frothing beasts. The significantly smaller females are often afraid of the aggressive males. Females bears killed from a bite crushing their windpipe—presumably from a male bear—and part of their shoulder eaten away have been found. Most fights between bears are between males fighting over receptive females. Many male bears have nasty scars from such fights. The gestation period of a grizzly bear is 225 days. Sows give birth to one to four blind, naked, squirrel-size, one-pound cubs in winter dens in January. Triplets occur frequently. The average litter size is 2.2 cubs. Most of the cubs survive until April or May when they emerge from their dens. Until they are weaned, young cubs follow their mothers everywhere and are nourished on milk than is as much as 33 percent fat. They make a buzzing sound like a swarm of bees when they nurse. Most cubs stay with their mothers for three years, hibernating together in the same den in the winter. Adult males play no role in the cub rearing process. The attrition rate among young cubs is very high. Around 40 percent never make to their second birthday. Many are swept up by rivers, die from hunger or are taken by other bears. Female grizzlies don’t reproduce until they are eight years old and then have litters of one or two cubs every four or five years.A study of grizzly bears at Banff National Park found that the bears reproductive rate is slow and doesn’t keep up with the rate in which they are killed off by humans. Many fights between bears are between females, often with a young female entering to close to an older female’s and cubs. Most of these fights consists of aggressive posturing and a few swats and little else and ends with a retreating bear. Describing a pair of fighting males, James and Frank Craighead wrote in National Geographic, "What a battle! Inge rushed his adversary and sank his canine deep in 88s rump. the momentum carried him over his opponent. But Inge recovered, seized 88's right thigh, and shook the 700-pound beast as a terrier shakes a rat...Eighty-eight broke away, and his huge jaws clamped on Inge's jowls. The boss bear roared, reared back to full heights, and fought free. A great red gash marred his face."